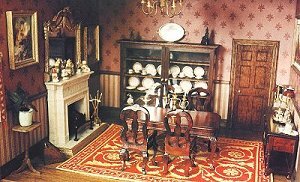 Sisters-in-law Maureen and Barbara have identical dolls houses, built for them by Maureen’s husband, Brian. They each have their own tastes in colour schemes and furnishings so, although the rooms have very similar things in them, they are different in make, style or colour. “Fortunately the rooms are big enough to take big furniture”, says Barbara. However, the size of the rooms was a slight handicap when the sisters-in-law began to embroider carpets to replace their cheaply-bought ones. They have to adapt carpet patterns to fit the rooms, which measure 15 x 13 in. Making miniature carpets is the latest addiction for Maureen and Barbara who also enjoy full-size tapestry. They share patterns but ring the changes by working the designs in different colours. 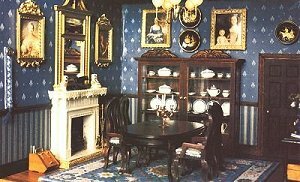 Their dining rooms have similar furnishings, but Maureen’s carpet is a version of Janet’s design “Elizabeth“, stitched in an alternative blue colourway. To complement the red bone china dinner service in Barbara’s dining room, the carpet this time is a design by Sue Bakker, stitched in the red colourway. 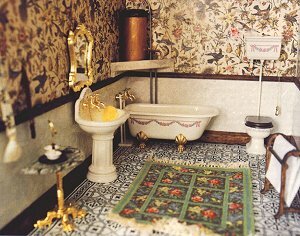 In her bathroom, Barbara has a ” Jessica” carpet.